Cause of her death was heart disease. Fannie suffered from high blood pressure. 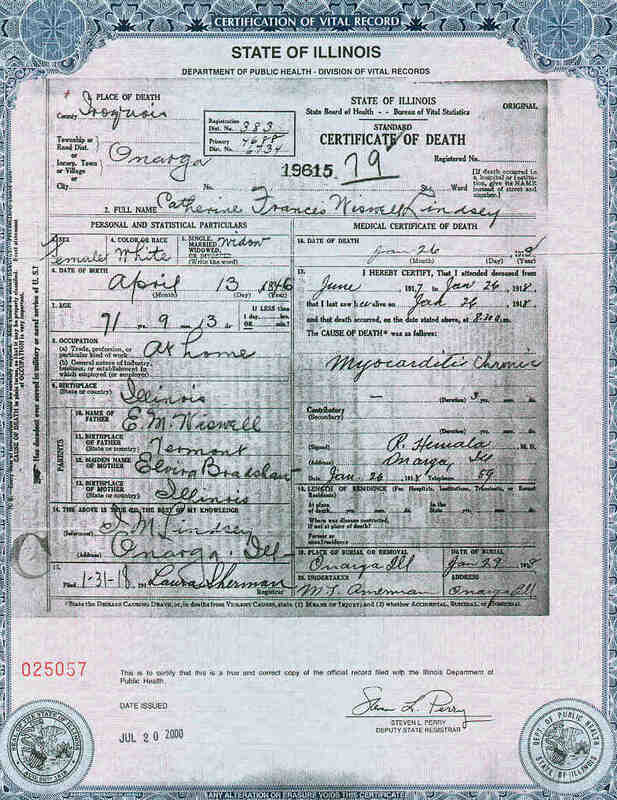 Another name for Catherine was "Fannie." • She appeared on the census in 1850 in Morgan County, Illinois. She lived in the household of her parents. • She appeared on the census in 1860 in Concord, Morgan County, Illinois. She lived in the household of her parents. • She appeared on the census in 1870 in Onarga, Iroquois County, Illinois. • She appeared on the census in 1880 in Onarga, Iroquois County, Illinois. 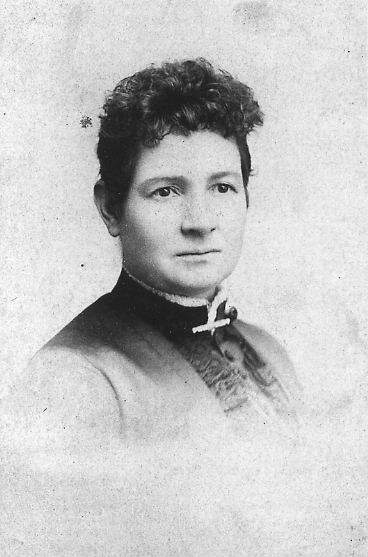 • She appeared on the census in 1900 in Onarga, Iroquois County, Illinois. • She appeared on the census in 1910 in Onarga, Iroquois County, Illinois. • She was a member of the Methodist Church, the WCTU, the Eastern Star, Rebekahs, and the WRC. • She was buried at Onarga Cemetery in Onarga, Iroquois County, Illinois in 1918. 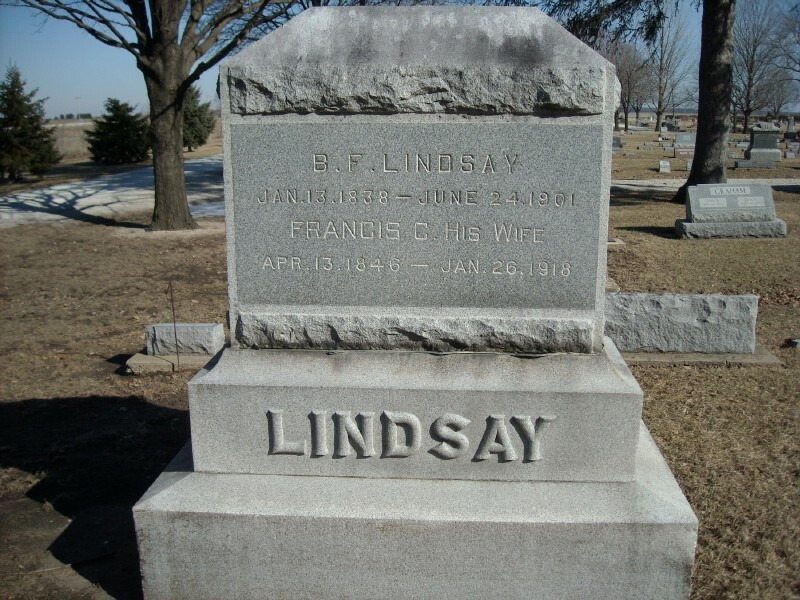 Catherine married Benjamin Franklin Lindsay, son of Ira Lindsey and Maria Ayres, 28 March 1865 in Jacksonville, Morgan County, Illinois 24.,71 (Benjamin Franklin Lindsay was born 13 January 1838 in Del Rey, Iroquois County, Illinois,24,73 died 24 June 1901 in Onarga, Iroquois County, Illinois 24,73 and was buried 26 June 1901 in Onarga, Iroquois County, Illinois at Onarga Cemetery.) The cause of his death was typhoid fever.